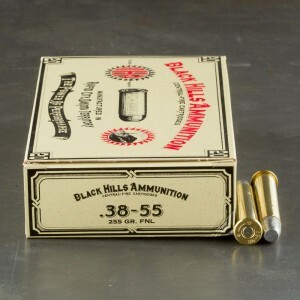 The 38 - 55 Winchester is a round designed for single shot target rifles in 1884. The round was produced and designed by the now defunct Ballard Rifle and Cartridge Company, and after they were defunct, Winchester adopted production of the cartridge. The round name is derived from its approximately 38-caliber projectile (In reality it’s a 3775 caliber) and the 55 grain of black powder that back it. Several different firearms were produced in the cartridge including Marlin lever action firearms. The round makes an excellent brush cartridge for its close range hitting power and its heavy projectile. 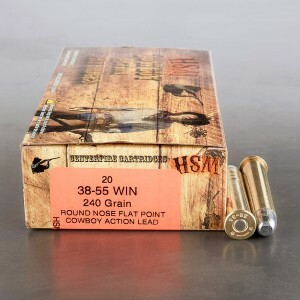 Projectiles are typically above 200 grain with the most common being the hard hitting 255 grain. At a velocity of over 1500 feet per second, the round packs a mighty close range punch. Anything further than 300 yards though and the round loses most of it’s velocity, making it inappropriate for long range. 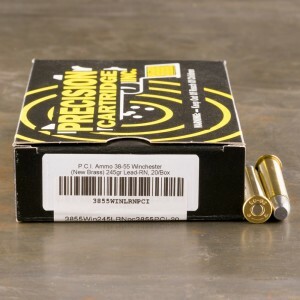 These guys are great - I placed a last minute order for this hard to find ammunition. Had folks coming up for 4th of July, and wanted them to shoot a historic gun (Winchester 1894 that's 120 years old). Ammo To Go got the order processed immediately, and it made it in time. Very memorable shooting and a great 4th!